Crawler type mobile crushing plant has serviced many customers in the worldwide. And it got good feedback because of its advantages. The first advantage is quality dynamic system. This machine adopts Cummins diesel with advantages of low fuel consumption, low noise and reliable performance, which provides a credible, economic and green power source. Besides, the engine can be equipped with low temperature preheating initiating device, which makes the equipment start up easily below -25C°. The second advantage is adopting all steel chassis with ship structure. This chassis can be suitable for mountainous region and wet land because of high strength, low ground pressure and good trafficability. The third advantage is adopting high torque walking motor with mature technology, big driving force and high reliable. This walking system adopts variable open hydraulic system with full power, and it can make full use of the power of the engine. In addition, main hydraulic parts adopt Japanese imported components. Then, operating system adopts imported servo pilot operating system which takes advantages of easy operation and precise control. And it can walk with non polar speed. 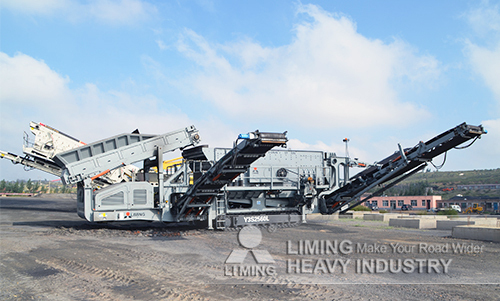 Finally, crushing and screening equipment is quality and mature product made in Liming Heavy Industry because of advantages of compact structure and stable performance. The obliquity of screening equipment is 20°, which makes screening work efficient and reliable.